The bestselling guide to motivating and managing everyemployee-updated for the new world of business! As a supervisor in today's highly competitive world, you must not only get more out of each employee-you must also prove your department's strategic impact on the organization. 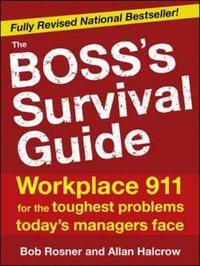 This popular, highly practicalguide helps you make your department shine. 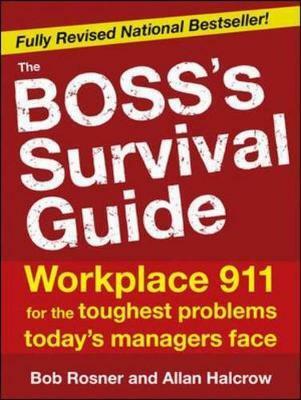 The Boss's Survival Guide, Second Edition, has beenupdated to help you manage today's hot-button issues, such as: Hiring and retaining the best talent Handling layoffs and terminations Using social networks such as LinkedIn and Facebook Managing time and dealing with stress Keeping up with the latest changes in employment law Maintaining your own marketability and managing your career Praise for the first edition of The Boss's Survival Guide "WOW!!!" -Tom Peters, author of In Search of Excellence "This book has everything you'll ever need to know about being an effective bossbut don't have time to learn." -Ken Blanchard, Ph.D., coauthor of The One-Minute Manager, Raving Fans, and Gung Ho "At last, a definitive guide for bosses on the hiring, care, and feeding of employees." -Richard N. Bolles, author of What Color Is Your Parachute? Bob Rosner (Bainbridge Island, WA) is creator of "Working Wounded," a nationally syndicated column and Web site. Allan Halcrow (Irvine, CA), is a consultant and the former editor-in-chief of Workforce magazine.